Fed up with booking a Viet Nam hotel reservation from directories only to find that don't correspond to reality when you arrive? 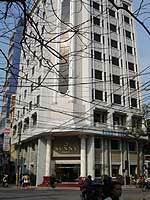 If so, you'll like our Vietnam hotel pages. We'll tell you how it really is - warts and all. We call it 'tourism with attitude'! Use this section to choose the Vietnam hotel you like, or to check up on another Vietnam hotel offered by other companies. When we design your itinerary, we'll select what we consider to be the best hotels in Vietnam in the areas you will be visiting according to the standard Vietnam accommodation that you have selected and provide you with details. If there's a similar alternative, we'll include that as well. If you want a particular Vietnam hotel, just let us know. Obviously, accommodation at your selected vietnam hotel is subject to availability at the time of booking, but as we work with small groups, there's not usually a problem unless the booking is late. However, there are a few places where there is only one Viet Nam hotel at a suitable level of accommodation, and is therefore often fully booked - in such instances, early booking is essential. In all itineraries that you receive from us, the level of accommodation will always be clearly identified with a brief note about particular features, if any. Detailed information about specific hotels and their facilities will usually be available on our web site. If you're interested in a hotel that isn't on our list, tell us and we'll find information about it for you. We only suggest hotels that we consider to offer good value for money. We inspect and classify many hotels and resorts according to the quality of their rooms, service, food, facilities and location and place them into the categories below according to those criteria. We use high quality establishments with international standard facilities in Deluxe and First Class and Luxury categories. Our Superior, Mid-range and 'local' hotels are carefully chosen to provide comfortable accommodation with Western-style facilities, well above the standard of 'budget' hotels offered by other operators. On pages where we provide room and hotel facilities tables, we assume that all rooms will be equipped with an en suite shower/bathroom with hot running water, IDD telephone, television, complimentary toiletries and laundry service as a matter of course. In general, hotels rated as 'Superior' or above will provide a minimum of a bath with a shower fitting. A few mid-range and some 'local standard' hotels have only a shower. We do not offer a 'budget' category unless customers particularly request it, or unless it really is the only acceptable accommodation in the area. In such cases, we would specify appropriate standards of service and facilities to the hotel prior to your arrival. Some accommodation in Vietnam defies classification. For example, an 'away from it all' resort may be without telephones, television, or even hot water, but cost the same as a four or five star hotel on the basis of complete solitude, a stunning location, excellent service and a high-quality restaurant. For these, we'll tell you what you can expect, and what creature comforts you'll have to do without! Amongst the many hotels in Vietnam, a few stand out from the rest. In our hotel listings, Featured Hotels range from First Class luxury to local standard and are limited in number, but all are exceptional in some way. To be considered, a hotel must provide excellent service and value for money together with singular features, such as rich character, striking views, unusual facilities, a commitment to sustainable tourism, and so on. Needless to say, our Featured Hotels are very popular, so early booking is necessary. 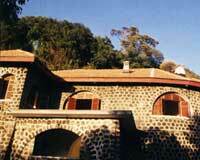 On some tours and holidays, we offer 'homestays' - accommodation in local people's houses. 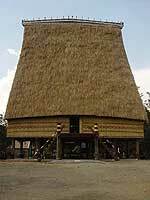 These are typically traditional wooden dwellings, often located in ethnic villages or areas of natural beauty. They usually lack most of the facilities you would normally expect even in a basic hotel - no shower (or hot water! ), sometimes no electricity, and toilets 'au naturelle', for example. Sleeping is normally communal on thin mattresses with small pillows on the floor. However, the warmth of your welcome and the opportunity to get a little closer to the rural culture of Vietnam are more than adequate compensations for most people. For those who find the prospect of homestays somewhat daunting, it's usually possible to find adequate alternatives in the area. Some of the ethnic houses that we use have a long tradition of hospitality and are used to seeing tourists. We also travel further afield to more remote villages where visitors are a rarity. In such cases, we take care to ensure that our presence respects the traditions and beliefs of the people who live there and do our best to contribute positively to the conservation of their culture. In national parks, accommodation is often limited to official 'guest houses'. Rooms, facilities and eating arrangements are usually very basic, and lack the charm of an ethnic house. However, the location usually compensates. Camping is possible on a few official sites, but camping 'wild' risks a brush with the police and the unwelcome attention of local people. Descriptions of, and information about, hotels are compiled using a combination of details supplied by the hotels themselves, feedback from our customers, and our first hand knowledge of hotels we have inspected. All information is provided in good faith. However, we cannot accept responsibility for its accuracy. Many of our hotel descriptions include subjective opinions relating to the merits or deficiencies of particular establishments. However, tastes and attitudes differ from person to person. Once again, we are cannot be held liable if you disagree with our assessment. In all cases, including hotels that we highlight as 'Featured Hotels', we neither seek nor accept inducements or benefits of any kind.